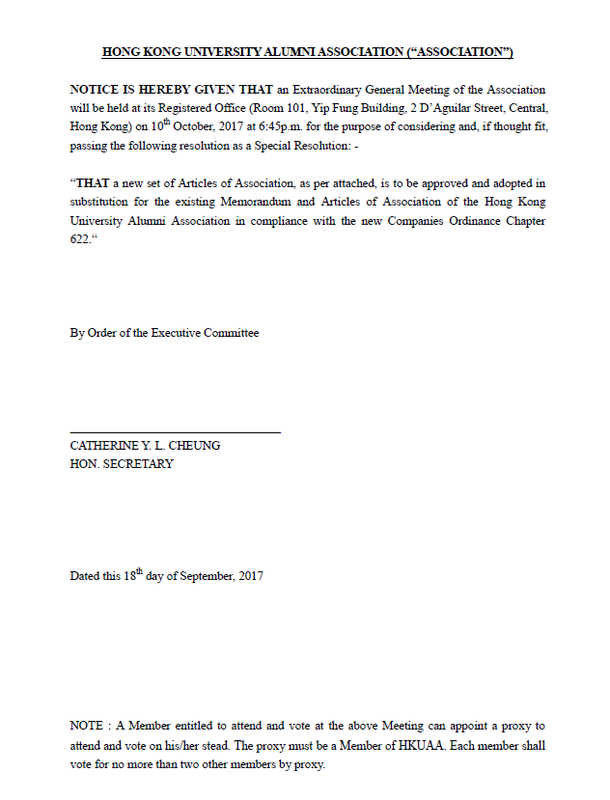 (1) Any relevant form should be returned to the HKUAA Administration Office at Room 810, Yip Fung Building, 2 D’Aguilar Street, Central, Hong Kong, before 18:00 on Tuesday, 3rd October, 2017. (2) During verification process, the member whose name appears on the any of the forms may be contacted by telephone or email. Identification document(s) may be requested. (3) Any form which carries incomplete information, inaccurate information, information which cannot be verified with the HKUAA official record, unable to fulfill the verification process, duplicated submissions, or reach HKUAA after the submission deadline, will be declared void. (4) A Designated Proxy is the specific person that is appointed by the member other than the Chairman of the Meeting(s). The Designated Proxy must be an Ordinary / Life Member of the Association. Each Designated Proxy shall vote for no more than two other members by proxy. (5) The decision of HKUAA shall be final in case of dispute.